About two years ago I wrote a review of Sweet Baby Ray's Beef Jerky - Honey Chipotle, but never managed to review their Original variety. The company who makes this jerky, Bridgford Food Corp, recently sent me a sample package. 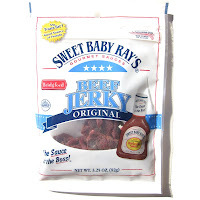 Sweet Baby Ray's is actually a brand of barbecue sauces and marinades that has been on the market since the 1990s. In addition to extending their brand to beef jerky, they've also extended into potato chips. This particular original variety is said to be based on Sweet Baby Ray's original barbecue sauce, the same sauce that made Sweet Baby Ray's famous. Beef, water, seasoning blend (salt, brown sugar, sugar, mustard, monosodium glutamate, dehydrated garlic, red pepper, sodium erythorbate, onion powder, spice extractive), brown sugar, Sweet Baby Ray's Jerky Base (vinegar powder, tomato powder, pineapple juice powder, worcestershire sauce powder, natural smoke flavor, spices, and not more than 2% silicon dioxide), sodium nitrite. The first thing I taste from the surface of these pieces is a moderate sweetness, followed later by a faint saltiness. There's also a faint bit of onion noticeable. The chewing flavor starts with a little bit of a tanginess, a little bit more of the onion. The saltiness picks up some more, as well as the sweetness. For being marketed as a beef jerky based on Sweet Baby Ray's barbecue sauce, this doesn't really have a barbecue sauce flavor at all, let alone tasting like Sweet Baby Ray's barbecue sauce. There is a medium-level sweetness in this, a light bit of tanginess in the chewing, and what appears to be a light onion flavor. That's about all I can attribute to a barbecue sauce. But even then, it still doesn't have a barbecue sauce flavor. This actually tastes very comparable to Bridgford's Original beef jerky, with just a touch more flavor. 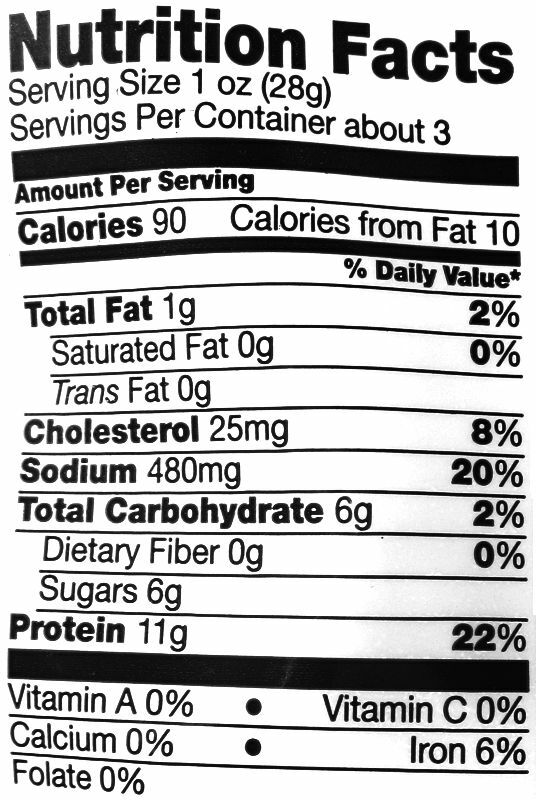 Otherwise, the ingredient that seems to generate the most flavor in this is the sugar. The medium-level sweetness I described above is pretty much what registers on my tongue more than any other flavor. When I compare this Sweet Baby Ray's Honey Chipotle, I find there's just a tiny bit less sweet in this Original, while the Honey Chipotle clearly has an increased spiciness and pungent flavor. In this Original, the only seasoning that really shows up is a light onion flavor, along with a medium level saltiness. Otherwise, there isn't much other flavor. I don't really pick up much of any natural meat flavor, maybe a smidgeon in some of the drier pieces. 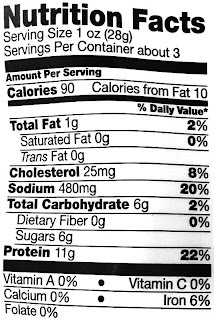 Overall, what you're going to notice in this is mostly a medium level sweetness, with a medium level saltiness, and a light onion flavor. It's doesn't really taste like barbecue sauce, let alone Sweet Baby Ray's barbecue sauce. 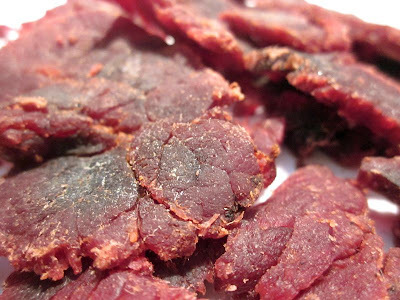 It tastes more like Bridgford's original beef jerky, just a bit more sweet and a bit more onion. These are slices of whole meat, sliced to a medium thickness, an in small to medium sized pieces. 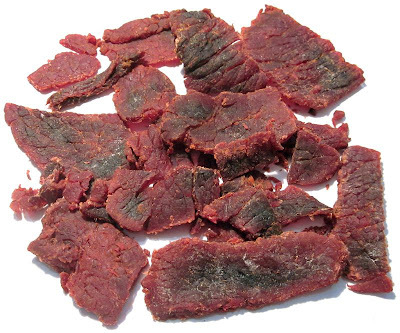 This is a mixture of dry and semi-moist jerky, mostly with a dry surface feel. Some pieces have a darker-colored center, which turns out to be dry and a little brittle. Otherwise, most of the pieces have a lot of flexibility and are quite soft. Tearing these pieces apart is easy, and chewing seems easy. The chewing texture starts out feeling soft, with just a light bit of initial chewing resistance. With a just a few chews, and this jerky starts breaking down easily, and quickly renders into a soft mass. At that point, it feels very similar to a piece of steak, comparable to one cooked medium, maybe just a little bit more soft. I don't see any streaks of fat on these pieces, nor do I find any streaks of gristle or tendon. Tearing pieces apart does reveal a significant amount of stringiness, but it didn't really result in any unchewable wads of tissue. In terms of clean eating, I didn't get any residue on my fingertips, and but just a light bit of meat fragments landing on my lap. Bridgford Foods sells this Sweet Baby Ray's Original from its website at a price of $26.94 for six packages, with each package at 2.75oz. Add to that shipping of $8.06 (delivered to Southern California), and the total comes to $35.00. That works out to a price of $2.12 per ounce. For general jerky snacking purposes, at the $2.12 per ounce price, it's a fair value. I'm not getting much snackability from this, due to a low flavor complexity, and a rather uninteresting flavor overall, though a good meat consistency and chewing. Compared to other major brands of jerky at this same price, I don't see this as a worthwhile purchase. As a Sweet Baby Ray's Original variety, at the same $2.12 per ounce price, it's a poor value. I don't really get any barbecue sauce flavor, let alone a Sweet Baby Ray's barbecue sauce flavor, or any sense that this is giving me the same experience as eating barbecued beef. 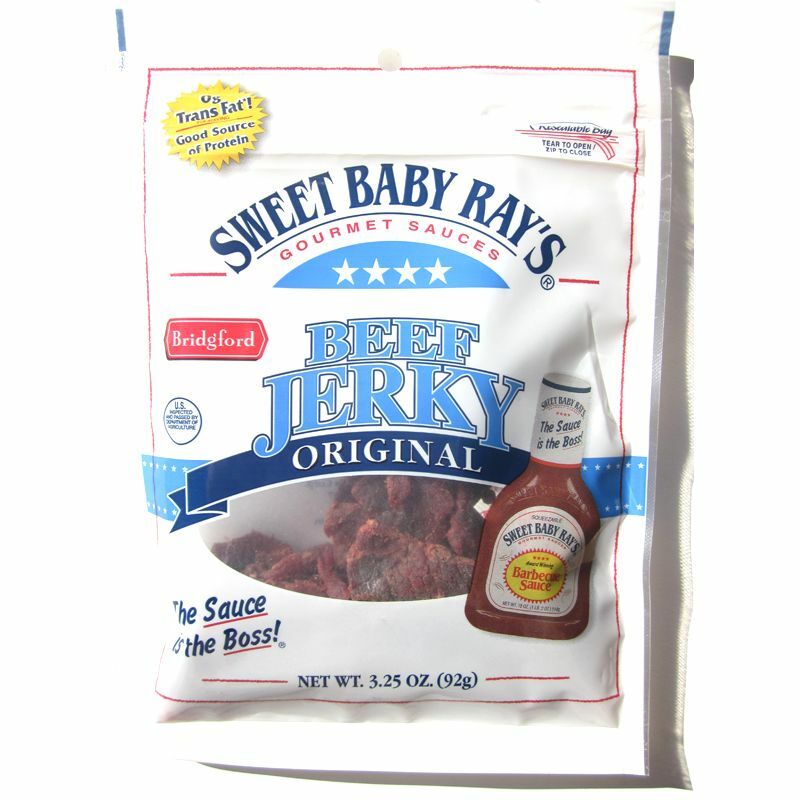 This Original variety from Sweet Baby Ray's offers only a moderate sweetness as its primary flavor, with a medium-level saltiness, and a light onion flavor. It doesn't seem to provide any barbecue sauce flavor, at least nothing resembling the award-winning flavor of Sweet Baby Ray's. When you consider that Sweet Baby Ray's is putting their name and brand on this product, you expect to get the same sweet, spicy, tangy, bold flavor that you find in a bottle of Sweet Baby Ray's. Yet what you get is something rather dull, and more comparable to Bridgford's regular beef jerky. You're better off sticking with Sweet Baby Ray's Honey Chipotle beef jerky, which offers more of a spicy flavor and a slightly increased sweetness. Though even the Honey Chipotle is not really all that exciting, it's still better than this Original. My recommended beer pairing for this, go with something lighter flavored to help bring out the beef jerky flavors better. Try a Alaskan Amber, or a Samuel Adams Boston Lager.